We’ve seen companies boasting that they’ve created incredibly small computers in the past, but most of these are still massive compared to IBM’s latest effort. 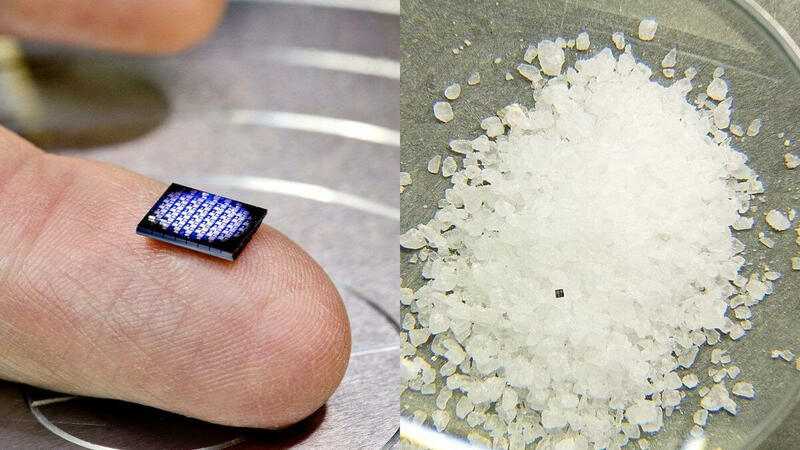 Measuring just 1mm x 1mm, its device is the size of a grain of sand. The company is unveiling the computer at its IBM Think 2018 conference, which starts today. You might imagine that it won’t be able to do much, but it has the compute power of an x86 machine from the 1990s. Not very impressive compared to today’s PCs, true, but then you do need a microscope to see it clearly—check out the picture of one placed on a pile of salt. 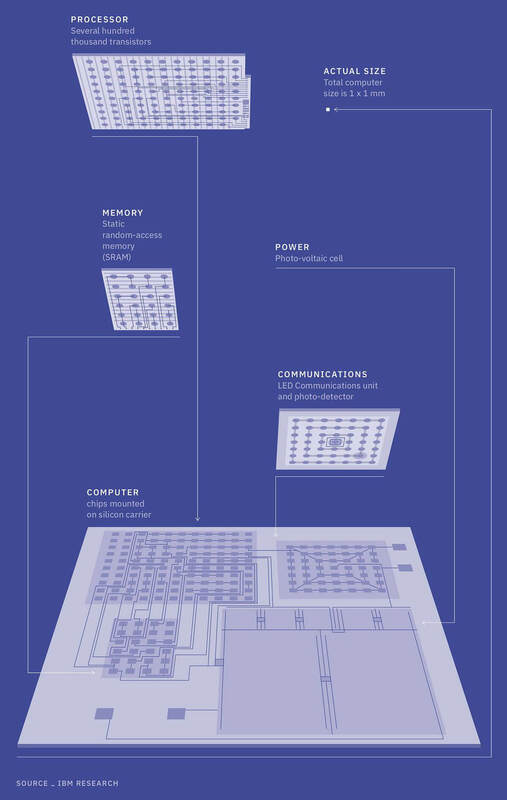 The tiny computer costs under ten cents to manufacture and contains up to one million transistors, according to IBM. The company said this “crypto-anchor” could be embedded in everyday items to improve shipment tracking and processing, acting as a data source of blockchain applications. "Within the next five years, cryptographic anchors — such as ink dots or tiny computers smaller than a grain of salt — will be embedded in everyday objects and devices," said Arvind Krishna, IBM's head of research. The tiny computer costs under ten cents to manufacture and contains up to one million transistors, according to IBM. "These technologies pave the way for new solutions that tackle food safety, authenticity of manufactured components, genetically modified products, identification of counterfeit objects and provenance of luxury goods." Mashable reports that the computer even has enough power to perform basic AI functions, such as sorting the data it's been given. In addition to all those transistors, it includes some static random-access memory (SRAM), a light-emitting diode (LED) and photo-detector for communicating, and a photo-voltaic cell for power. IBM’s researchers are still testing the prototype model, so don’t expect them to hit the market anytime soon. But it’s amazing to think the same power we saw in PCs from the 1990s is now available in something the size of a grain of salt. "The tiny computer costs under ten cents to manufacture and contains up to one million transistors, according to IBM." Yeah, it won't run Crysis, but that's damn impressive! skinnybuttons and stewi0001 like this. This is awesome! But how do you interface with it? You don't, it will interface with you, when you the least expect, like in your sleep. Shotgunnner, Danny101, liammac002 and 4 others like this. Sounds like you interface with it the same way your TV remote interfaces with your TV, LEDs. That's the only reason I see for putting LEDs and photo sensors on there. "LED communications unit and photo-detector" - see it's amazing what you can find out by reading the article. erickmendes and JaredTheDragon like this. I did read it, just didn't put 2+2 together this time. If you accidentally swallow it with your salt do you suddenly get extremely good at maths? Intel need to make some. Then you really can have an intel inside. bobc4012, MirekFe, TheGreatCabbage and 6 others like this. MirekFe, VBKing and cliffordcooley like this. It turns out reading is good, hard to believe. Do you want Borg, because this is how you get Borg. I was thinking the same thing. I never have considered rock salt a grain. And what they have pictured is rock salt. Install one in each person, and start the zombie apocalypse, or control your own slave army. Maybe they're already in place - this would explain a lot of recent behavior. Get your supply of tinfoil before it's all sold out, and start making those hats. I have to disagree, I am an expert on The Borg having watched every Borg related episode of Star Trek at least twice - this includes movies - I can assure you IBM was never mentioned in the creation of The Borg. I really want to make a joke about taking the news with a grain of salt but I'm stuck... Anyone got anything ? What do you think the B of IBM stands for... Invasive Borg Machine. Is it on the 7nm process ? "basic AI functions, such as sorting the data it's been given"
IBM does not equate to Intel, the phrase would be IBM Inside. Yes please put it into everyday products and add a tiny microphone to it. It will end up in the sea and when the birds and fish eat it they'll become cyborgs. 10 cents manufacturing cost? It will be everywhere. If it not already is. A "grain of salt" might be a bit of an exaggeration. Based on that pic, that's more like 20 grains of sea salt. Still, impressive. I measured that picture and then "-" on my browser to reduce it to 1mm. Pretty damn small. Just don't drop it on a shag carpet (or any carpet).